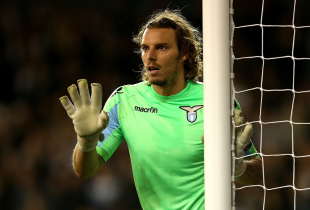 Lazio goalkeeper Federico Marchetti has played down new speculation linking him with a move to Arsenal. Marchetti, an Italy international, has been reported as a target for the Gunners in recent days – with the club believed to be keen to finally find an established No. 1 at Emirates Stadium. Marchetti would appear to fit that bill – the 30-year-old has cemented his reputation as one of the most reliable goalkeepers in Serie A since joining the Rome side from Cagliari in 2011. But the Italian has denied hearing anything formal from the Premier League club. “I know nothing about Arsenal,” Marchetti told Sky Sport Italia. “I’m having a holiday and only thinking about relaxing. Marchetti has long been on Arsene Wenger’s radar, with the North London club believed to have made an offer for the shot-stopper while he was still at Cagliari. QPR goalkeeper Julio Cesar has also been linked with Arsenal this summer.